I'm sitting here this fine Sunday morning watching the Master's Golf final round and writing this post. My body is in GREAT (LOL) Pain from all the yard work I've been doing these past few weeks. The reward is worth every weed pulled. This is a combination of photos from late March and early April. The roses are growing a foot a minute. I love Iris mixed with daffodils. Poppies, Don Juan and Grape vines all growing fast. Inside the patio, I've brought the tender plants out and added some annuals to the pots. The boxwood are new this year and the little violets are added for interest and filler. Jade plants are a wonderful addition to the patio. 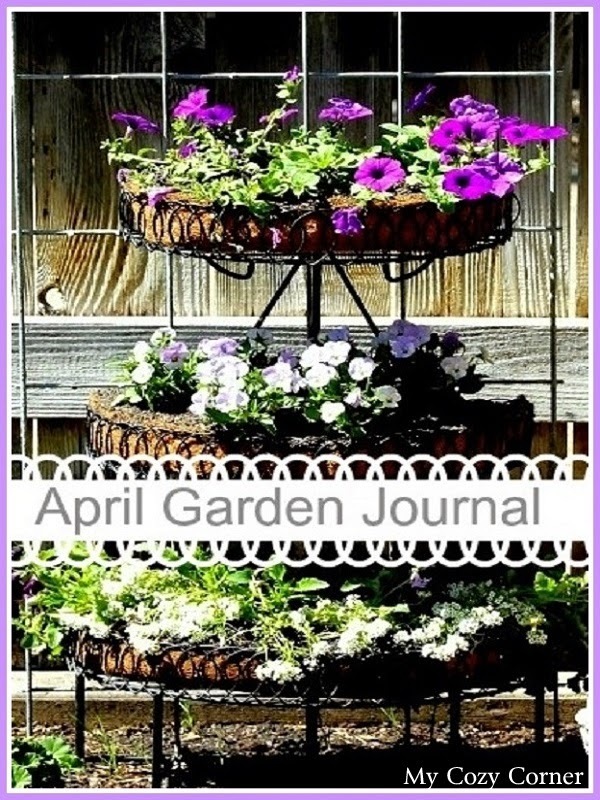 Just a little fun planter with some purple petunias and pansies the most fragrant alyssum. Thanks for visiting. I hope you've enjoyed your tour. 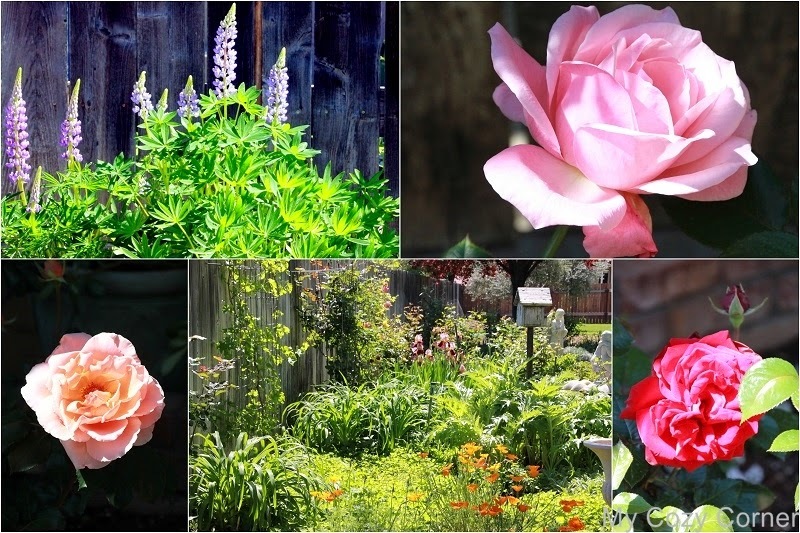 Your garden and flowers look lovely! A great reward from all your hard work! Lovely photo, have a happy week! Your garden is just lovely! Have you seen a Julia Child rose? She is absolutely beautiful and blooms her little heart out! Wow ~ you have so many beautiful flowers and plants ~ just gorgeous! Gorgeous! I can clearly see all of the hard work you've put into your gardens. Joining you from Little Red House. yard work. Hot baths in epsom salt and advil are my friends during the spring because that is when the major work is done. Bettye I love your planter in the first pic. So lovely. You should do a tutorial on how to add text and pattern on a pic. You have a beautiful garden. A joy to see! Your hard work has brought amazing results. Your garden is just what I love too! Lots of roses and perennials with a few annuals filling the gaps to add color and interest! You have some interesting garden ornaments too - a gorgeous little bird house, I wonder if my husband could build me one just like it! I really enjoyed the cyber tour of your garden. Now go have an epson salt bath, enjoy a spot of tea and read one magazine article rest time! You earned it!